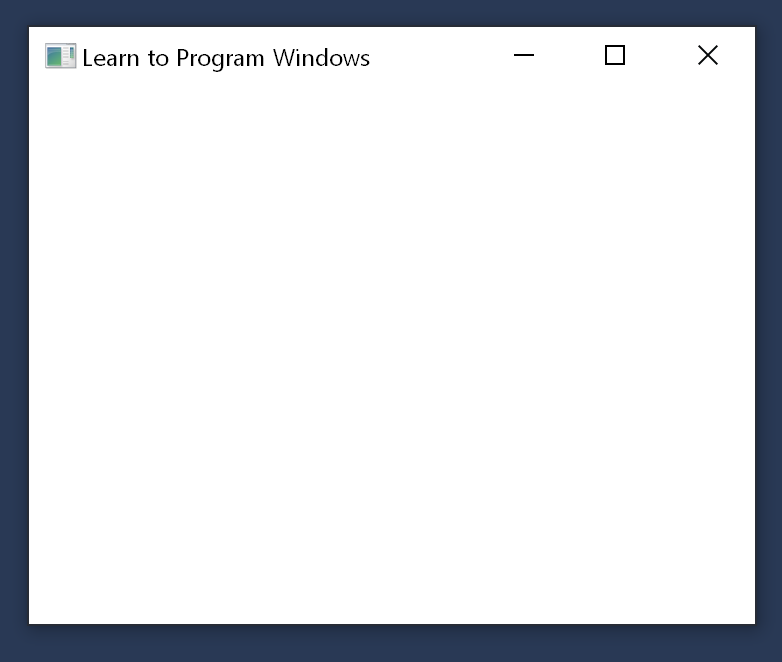 In this module, we will write a minimal Windows program. All it does is create and show a blank window. This first program contains about 50 lines of code, not counting blank lines and comments. It will be our starting point; later we'll add graphics, text, user input, and other features. You can download the complete Visual Studio project from Windows Hello World Sample. It may be useful to give a brief outline of what this code does. Later topics will examine the code in detail. wWinMain is the program entry point. When the program starts, it registers some information about the behavior of the application window. One of the most important items is the address of a function, named WindowProc in this example. This function defines the behavior of the window—its appearance, how it interacts with the user, and so forth. Next, the program creates the window and receives a handle that uniquely identifies the window. If the window is created successfully, the program enters a while loop. The program remains in this loop until the user closes the window and exits the application. Notice that the progam does not explicitly call the WindowProc function, even though we said this is where most of the application logic is defined. Windows communicates with your program by passing it a series of messages. The code inside the while loop drives this process. Each time the program calls the DispatchMessage function, it indirectly causes Windows to invoke the WindowProc function, once for each message.